Performance Time: Approximately 30-35 minutes, 36 pgs. COMEDY. Ever wonder why bears hibernate, why winter doesn’t last all year, and why wolves howl? 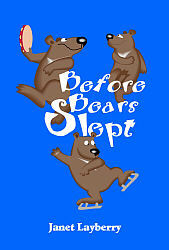 Well, you see, it all started with one troublemaking bear who loved winter and making snow angels. In fact, Bear loved winter so much, that he convinced the North Wind to stay—permanently! But the other forest creatures didn’t like the thought of their forest glade turning into a glacier. Cold, hungry and eagerly awaiting spring, Fox, Owl, and Squirrel send a lone wolf to talk some sense into the selfish Bear and the snobbish North Wind. Janet Layberry developed a love of the theatre while acting and directing in local community theatre companies in Ottawa. She graduated from the Algonquin College theatre program and has published several plays for children. Ms. Layberry lives in Ottawa, Canada, with her son, Craig.